Your home is where you dream to be while having a long day at work, where you spend time with your loved ones, where you feel most comfortable. It is your sanctuary. So when you’re looking for your forever home, you want it to mirror your lifestyle and your personality. That’s one of the main benefits of deciding on a custom home from Classic Custom Builders in Northern Colorado! From day one, and every step of the homebuilding process, we encourage your involvement and ideas to ensure that we build your dream home exactly the way that you want it. 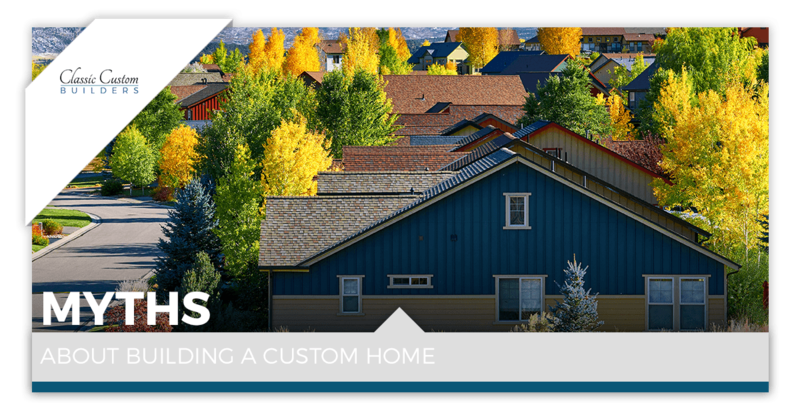 Over the years, we have talked to multiple clients that have expressed uncertainty about whether building a custom home is the right decision to make. 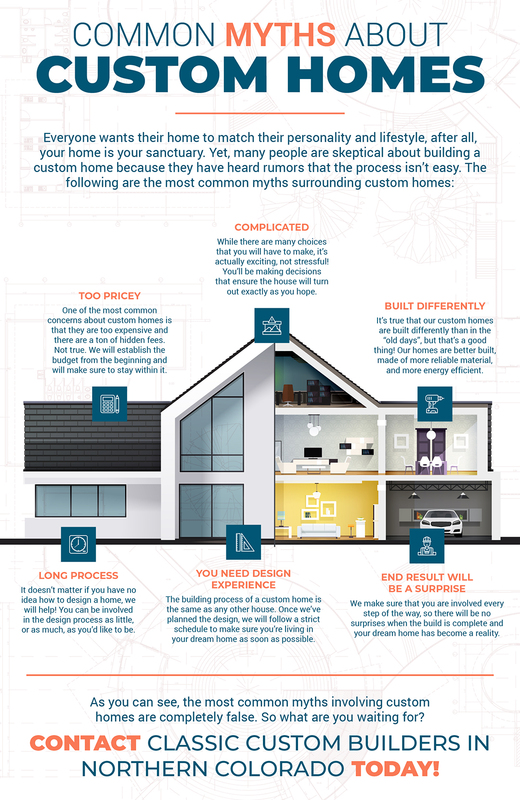 For some reason, a lot of myths swirl around custom homes and the process involved. So in this blog post, we’re going to debunk some of the most common rumors that we’ve heard. If you would like more information about our home building company, or are ready to start planning out the home that you’ve always hoped for, then contact us today! One of the most common myths surrounding custom homes is that it is too expensive, particularly when compared to buying an older home. However, just how potential homebuyers have a budget when looking for a new place, your budget will be a huge priority when it comes to your custom home as well! Right from the get-go, we will figure out a budget that works for you, and we will strictly adhere to that budget by recommending certain materials, appliances, building designs, etc. There will be no hidden fees during the build, and you will be kept in the loop at all times! Another reason that some people want to opt out for a house that has already been built, is that they think the process is just too complicated and time-consuming. We’re not going to lie, there are a lot of decisions that you’ll have to make while we build your custom home, but they are decisions that will make sure that the house we build matches your vision. The process should be more exciting than anything, not stressful! And our staff will make sure that every choice you make is easy and within your budget. Well, this isn’t technically a myth, it’s true! However, this is a good thing! Through advancements in technology, and innovative new tools and materials, our custom homes are better built, and much more energy efficient and environmentally friendly. Be sure to ask us about how to increase the energy efficiency of your soon-to-be home, and we’ll give you some options! Are you skeptical that it will take too long until you’ll be able to move into your dream home? While there are certain factors that can’t be controlled, such as the weather, but building a custom home takes no longer than it does to build a non-custom home! Once we have the design in place, we will create a detailed schedule and be sure to follow it. Even with all of the decisions that you’ll be making throughout the build, we’ll make sure that everything is ordered and installed when it needs to be. Some people get intimidated with the idea of building a custom home because they have the impression that they need design experience in order to be involved. This is not the case at all! You can be involved in the design process as little or as much as you like! Our team has built hundreds of custom homes in Northern Colorado and we are incredibly knowledgeable and skilled in designing the homes. If you have no idea what type of features or the general appearance of the home to look at, we’ll provide you with multiple options and ideas. Whether we look through homes that we have built in the past, or work out something new, we’ll make sure that the home exceeds your expectations. This is going to be the home that you live in, so it’s incredibly important to us that it meets every aspect of what you imagined. That’s why we make it a point to have you involved. There will be no decisions made without your input, and you’ll be able to visit the site whenever you’d like. Communication is key to us, and we look forward to building a house that you can call a home. If you have any further questions about our process, or are ready to start drawing up the plans for your custom forever home in Northern Colorado, we can’t wait to get started! Contact us today.